A “love fest” may feel great at first (‘oh my gosh, they think I’m great!’), but it soon gets old, and the growth curve for those involved is severely hampered. This is where everyone just congratulates, retweets, likes, etc, everything everyone ever does. But because everything is so GREAT all the damn time, no one gets any better. So go ahead and join the love fest if you want. You may get a gig or two out of it, but you’ll never be any better than the day you join. It’s not for me. The “shark tank” is the opposite of the love fest, and is characterized by snarky attacks, arrogant snubs, and all around competition and condescension. Success is a zero sum game in the shark tank. In order to rise up in the hierarchy, you have to pull someone else down. And to stay at the top you have to step on any new comer and reestablish your dominance. This is a culture of fear in which sharing your work is akin to putting raw meat into the water. Sorry, it’s also not for me. It starts with caring. Does it matter to you whether other people get better over time, or do you just care about your own reputation? If you don’t get this one right, don’t bother with the other five on the list. Just please also exit stage left. Always create. The best way to have a useful opinion is to always be visualizing data. You’ll have fresh understanding of the inherent trade-offs and dilemmas, and you’ll have much better suggestions and ideas to deal with them. Try different tools and techniques. What we’re doing by building this community goes beyond any one company’s quarterly growth objectives. It’s about increasing the data literacy of our species on this planet. Yes, you’ll likely interact more with people who use the same tools as you. Make an effort to connect outside of those subgroups so that they don’t become silos. 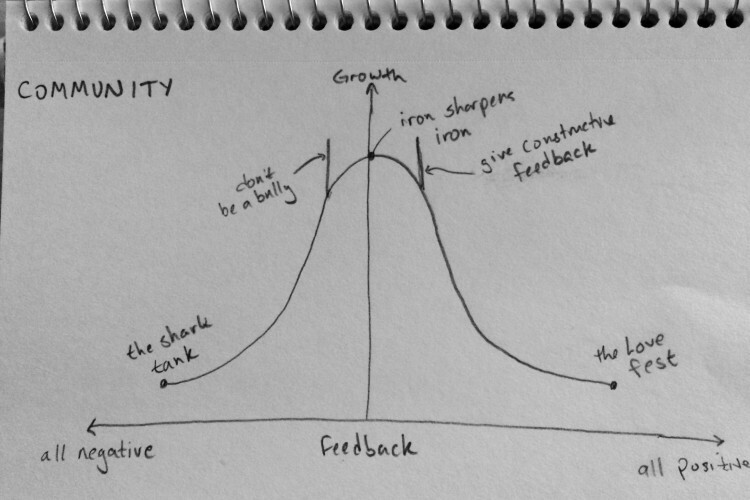 Seek feedback. After you create something, ask people to look at it and give you their thoughts. What was confusing? How could you increase the impact of the message? Listen to what they say and resist the urge to intervene and explain. And don’t make it an exercise in fishing for compliments. Give honest feedback, with tact. Tell people what you think. Don’t hold back. Just be tactful. Organize your feedback in terms of plusses and deltas – what did you like and what could have been even better? And ask them what they think about your suggestion – “do you think that would work?”, etc. A little humility goes a long way. Never fall into the trap of the expert. People who think of themselves as experts tend to stop listening. They become close-minded. But there’s always so much to learn. I’m not advocating fake humility, here. Sure, you have knowledge and skills that someone new can benefit from. But I guarantee you that every newbie has a few things to teach you, too. I also reached out to Alexander Mou via twitter to ask him if he had any suggestions to make it better. Alexander regularly posts suggested improvements via twitter on what he calls #TweakThursday. I’ve seen him do that for a few months now, and I often like his ideas, so I thought I’d request his input proactively. He not only created a souped-up version, he wrote about it here. Ben, this is a fantastic post and a message all of us need to hear! I love your quote of “Iron sharpening iron” as that perfectly describes the balance of how we can work together to knock off rough edges – but for each others’ benefit. 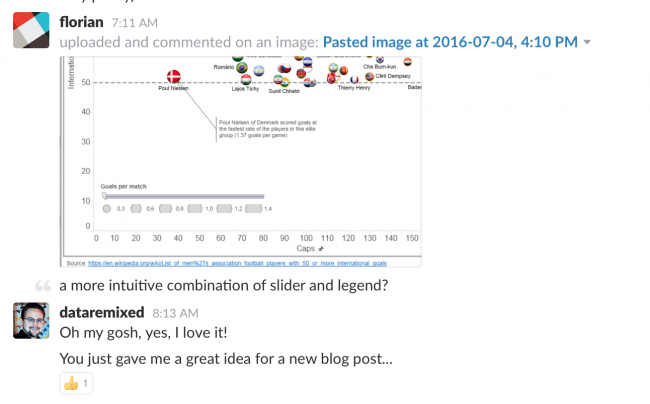 One of the best examples of this in the Tableau community is on the Tableau forums. Several years ago, I started answering questions as an “expert” but very quickly got gentle correction from people like Shawn Wallwork and Jonathan Drummey. I learned very quickly that I didn’t know everything and that the best answers were ones that started with, “one way to do this is…” because there are many approaches, many different flows of thought, many different ways to see things. And while there are some things that are flat out wrong and need correction; and while there are sometimes “better” approaches — there is seldom (never?) one right way of doing something. The humility mixed with mastery and an eagerness to help others which I saw in the leaders on the forums is something I have tried to emulate ever since.